Whether you plan to lounge by the pool or take a stroll on the beach, this week's new designs are sure to jump-start your summertime stitching! 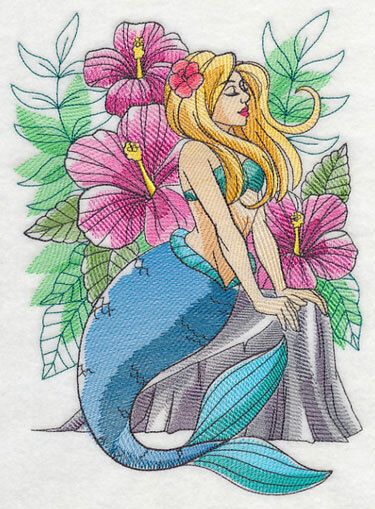 New watercolor designs are striking on bath decor, tote bags, and more, while mermaids of all shapes and sizes adorn swim cover-ups, beach bags, and T-shirts. 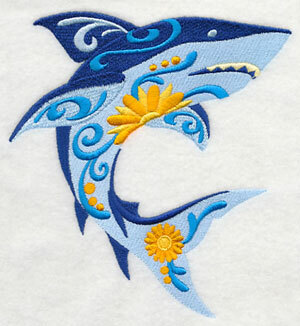 Tropical sea creatures in the flower power style will evoke the sun, salt, and sand of the ocean. Plus, new samplers and His and Hers towels, too. 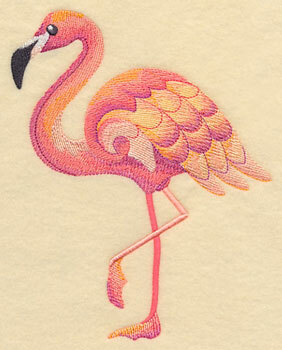 Scroll down the page to find designs for your summer stitching inspiration! Create your own beach-ready tote with one of this week's bright and summery designs. Take a trip to the depths of the ocean with these colorful sea creatures. Vivid color and ornate details give the deep sea dwellers a look that's straight off the boardwalk. 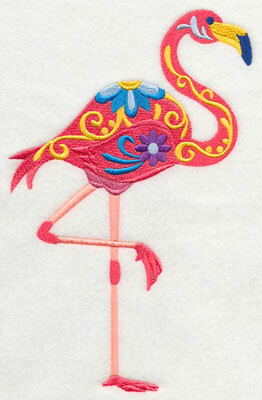 5.85" x 8.72" and 4.60" x 6.85" and 2.59" x 3.85"
The Flower Power Pals are always a popular addition to embroidery projects, and these tropical variations are sure to wow on tea towels, beach bags, swimsuit cover-ups, and more. 6.19" x 5.86" and 5.13" x 4.86" and 3.86" x 3.66"
Add a sweet seahorse to a beach towel, or adorn your sun umbrella with a pink flamingo. 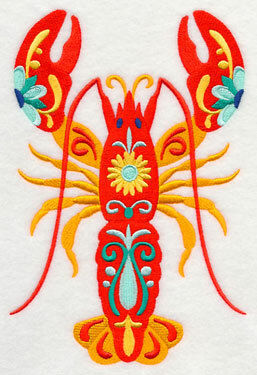 Flowers, flourishes, and more embroidered accents give each of the sea creatures their own unique style while staying true to the flower power theme. 5.85" x 9.19" and 4.37" x 6.86" and 2.45" x 3.86"
Not only are these Flower Power Pals a fantastic way to add ocean flair to your embroidery projects, but they also capture the summery feel of a trip to the beach. 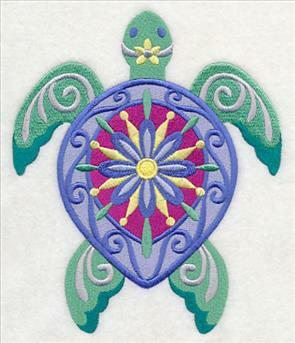 Use the larger size to adorn a pillow or tote; smaller options shine on T-shirts or towels. 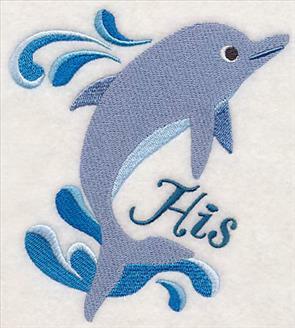 7.80" x 5.71" and 6.66" x 4.88" and 3.86" x 2.83"
Fans of classic water animals, such as the dolphin and shark pictured here, will love embroidering these designs on quilts, bedding, framed art, bath decor, and so much more. 5.86" x 6.46" and 4.86" x 5.36" and 3.50" x 3.86"
Finish off this collection of ocean designs with a radiant tropical fish. 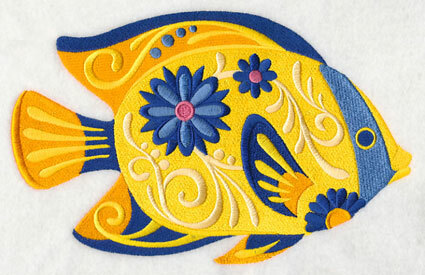 The bright blue and brilliant yellow contrast beautifully on any embroidery project. 9.22" x 5.85" and 6.86" x 4.35" and 3.85" x 2.45"
Stunning detail and blooming bursts give these tropical creatures a striking appearance. Add them to your cart by using the links above. 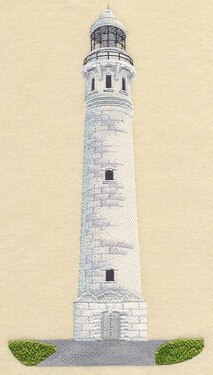 As soft and delicate as a sea breeze, these designs embrace the beauty of a watercolor painting. They've been specially digitized to embody the strokes of a paint brush. 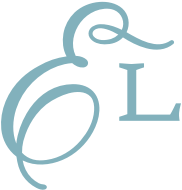 Stitch on bath towels, quilts, and more. 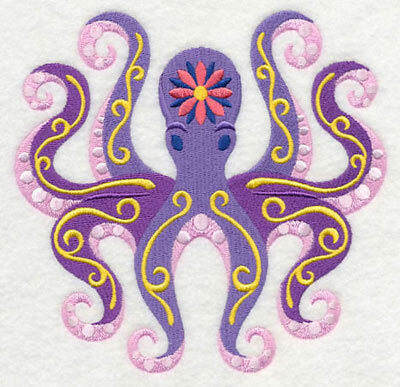 5.86" x 7.45" and 4.84" x 6.15" and 3.03" x 3.86"
Six different sea creatures have been created in this watercolor style, and will add layers of depth and texture to any embroidery project. 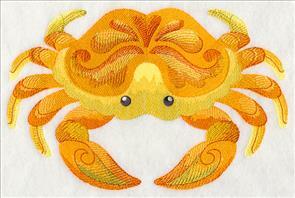 Impressive additions to pillows, placemats, and bath decor. 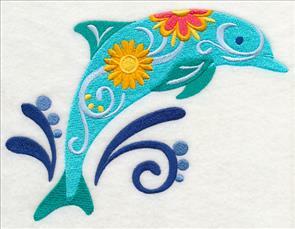 7.28" x 5.85" and 6.03" x 4.85" and 3.85" x 3.10"
Sea life is a popular motif for adorning bath decor, towels, and more. 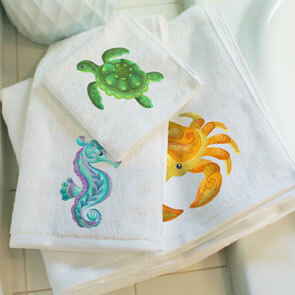 Stitch these watercolor sea creatures for a delicate and eye-catching addition to your bath projects! Beach-lovers will adore projects featuring all six of the designs -- or pick your favorite to stitch alone. 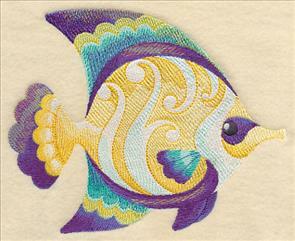 The ornate tropical fish and starfish designs below are an eye-catching way to stitch the spirit of the sea. 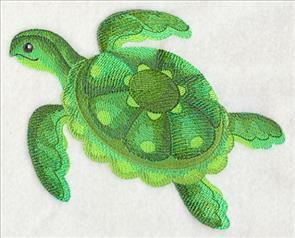 Perfect for table and bed linens, aprons, wall hangings, and framed artwork. 6.77" x 5.86" and 5.60" x 4.84" and 3.86" x 3.34"
Add these stunning watercolor animals to bath towels, swimsuit cover-ups, and more. Pick one to add to your cart by using the links above. Or, get the whole group in a design pack. 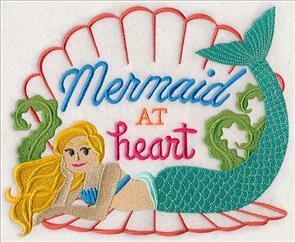 If you're a mermaid at heart, you'll love adding these designs to kids' decor, a new tote bag, or beach gear! 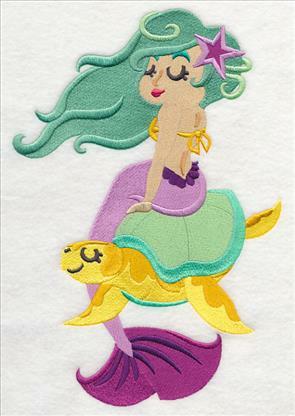 They come in an amazing variety of shapes and styles (like this breathtaking tropical mermaid below), and will add ocean flair to any embroidery project. 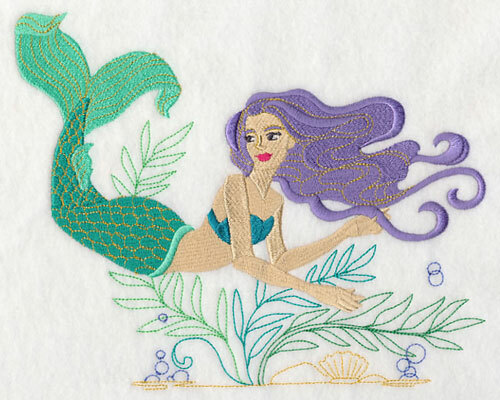 6.90" x 9.53" and 5.65" x 7.80" and 4.89" x 6.76"
The subtle use of metallic thread gives this beautiful mermaid a glistening look. 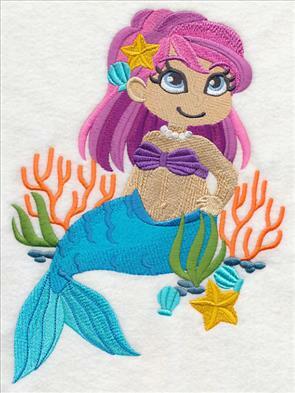 Stitch this striking sea goddess on denim jackets, backpacks, shirts, totes, pillows, and more! 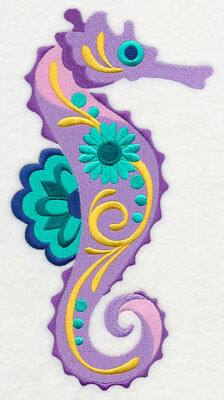 Find our top tricks for embroidering with metallic thread right here. 8.54" x 6.90" and 7.81" x 6.31" and 7.03" x 5.68" and 6.01" x 4.85"
Fun color palettes and non-traditional artistry give these mythical mermaids a fun, light-hearted flair. 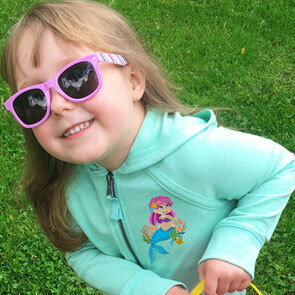 Great for kids' apparel, quilts, nursery gear, and more! 6.90" x 10.20" and 5.86" x 8.65"
5.29" x 7.81" and 4.64" x 6.86"
6.91" x 9.64" and 5.60" x 7.81"
4.87" x 6.78" and 2.77" x 3.86"
Kids' T-shirts, sweatshirts, backpacks, and more are the perfect place to embroider one of these too-cute mermaids. 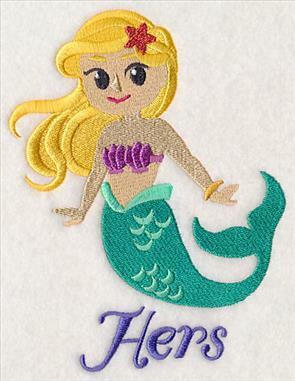 Update your favorite lil' beach babe's bedroom decor with a pillow or quilt adorned with the lovely mermaids, or use on a beach towel or swimsuit cover-up for their next trip to the sandy shores. 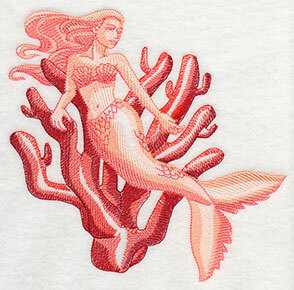 A sketch-style mermaid lounges on a coral reef. 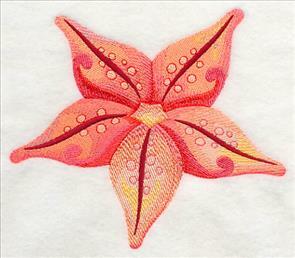 We've stitched the design to match the color of the coral -- pick your favorite hue to use on your project. 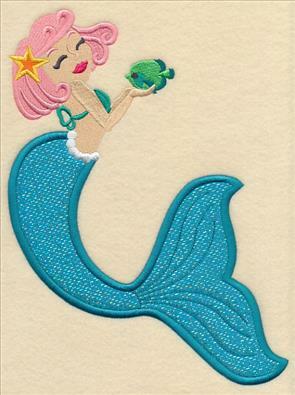 7.40" x 6.90" and 6.27" x 5.85" and 5.20" x 4.85"
A mermaid's tail is known for having a shimmering, scaly look. 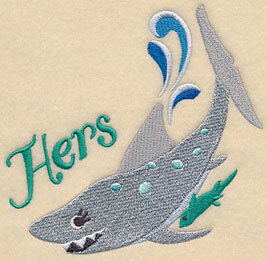 Mimic the look in your embroidery with applique fabric! 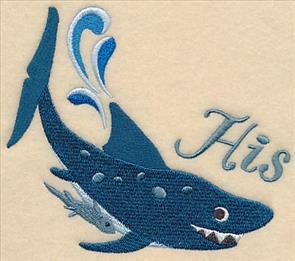 Get tips and tricks for embroidery applique designs in this helpful tutorial. 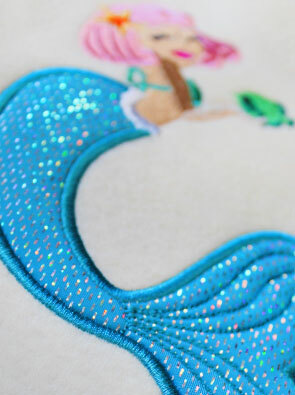 6.90" x 9.91" and 5.86" x 8.41"
5.28" x 7.57" and 4.78" x 6.86"
The metallic accents in this fabric give the mermaid's tail a glistening look. 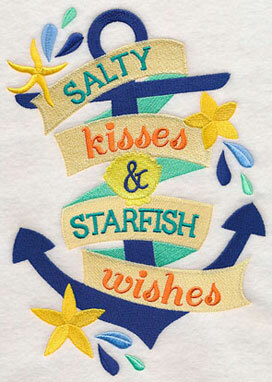 Add warm summer wishes to tote bags, pillow shams, wall hangings, and framed wall art with these songs of the sea. 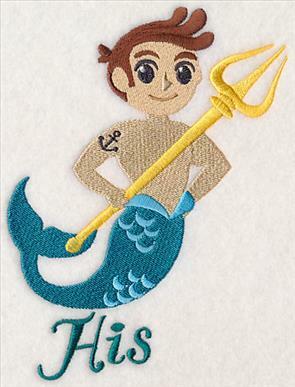 Perfect for your favorite mermaid or merman! 8.46" x 6.91" and 7.83" x 6.40"
7.17" x 5.86" and 5.95" x 4.86"
7.79" x 7.47" and 6.95" x 6.67"
6.11" x 5.87" and 5.07" x 4.87"
Turn any trip to the beach into a laid-back affair with a colorful roll-up beach towel! Lay the towel out while you swim and sun, or use it to dry off after a dip in the water. Then fill the pockets with your beach necessities, roll it up, and you're ready to go. 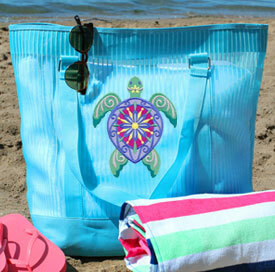 It's a beach towel and tote all in one! 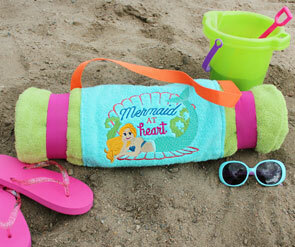 Click here to find the free project tutorial for this roll-up beach towel. 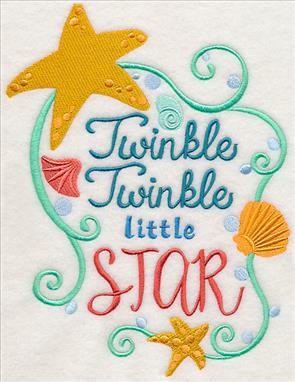 Nurseries and kids' gear will get a sweet, seaside accent with these charming designs. Stitch on baby blankets and quilts! 6.91" x 8.84" and 5.86" x 7.50"
6.91" x 9.54" and 5.66" x 7.81"
4.84" x 6.68" and 2.80" x 3.86"
Make a splash on your next project with bright and colorful His and Hers designs. 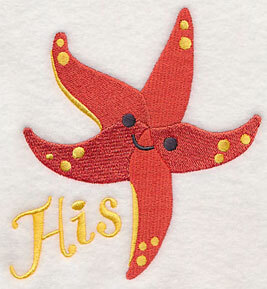 The cute couples are perfect for stitching on bath towels, hand towels, or even beach towels! 4.88" x 6.40" and 2.94" x 3.86"
couple -- you can find helpful tips and tricks for embroidering on terrycloth in this tutorial. 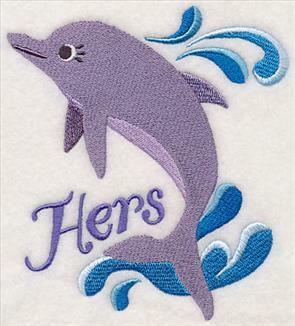 4.84" x 5.36" and 3.49" x 3.86"
The His and Hers are on separate color stops, so you can embroider just the sea creatures on any project you like -- it's like getting two designs in one! 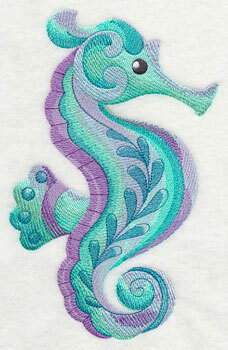 Let these seahorses swim onto your next set of towels. 3.17" x 6.75" and 1.82" x 3.86"
These friendly sharks are sure to bring smiles. 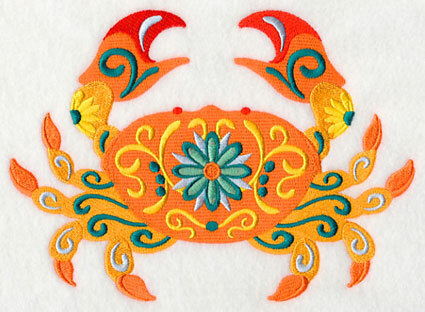 Add them to towel sets for your bathroom at home, or your beachfront getaway. 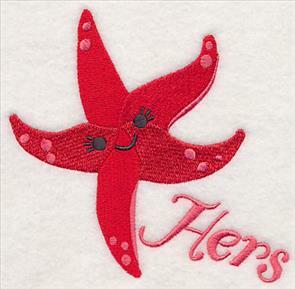 Find the free tutorial for embroidering on terrycloth towels right here. 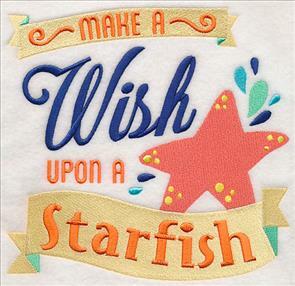 5.23" x 4.86" and 3.87" x 3.59"
These charming starfish are ready to dance right onto your next embroidery project. Cute on beach bags and swimsuit cover-ups, too! 5.05" x 4.86" and 3.86" x 3.71"
Ina-Maria is making a quilt for her daughter with designs from all over the world. 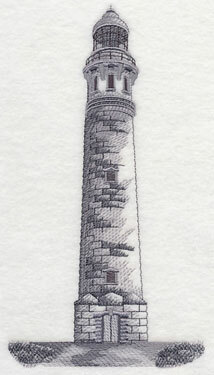 She says her "travel-bird" is living in Australia, and requested the Cape Leeuwin Lighthouse to represent her home base. What a great suggestion, Ina-Maria! 5.14" x 9.43" and 4.67" x 8.57"
5.13" x 9.43" and 4.67" x 8.57"
4.24" x 7.79" and 3.73" x 6.85"